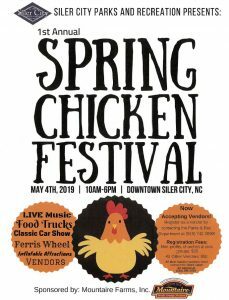 First-ever Spring Chicken Festival in historic downtown Siler City. Bring the family for live music, food trucks, a classic car show, Ferris wheel, and many vendors. Event sponsor: Mountaire Farms. Event coordinated by Siler City Parks and Recreation. More details soon.